The Sun rotates in 25 days. The star GJ 1243 the authors are studying rotates in 14 hours. If the Sun revolves like the restaurant on the Space Needle, GJ 1243 revolves at the speed of a lighthouse. Compared to the Sun, GJ 1243 rotates fast. 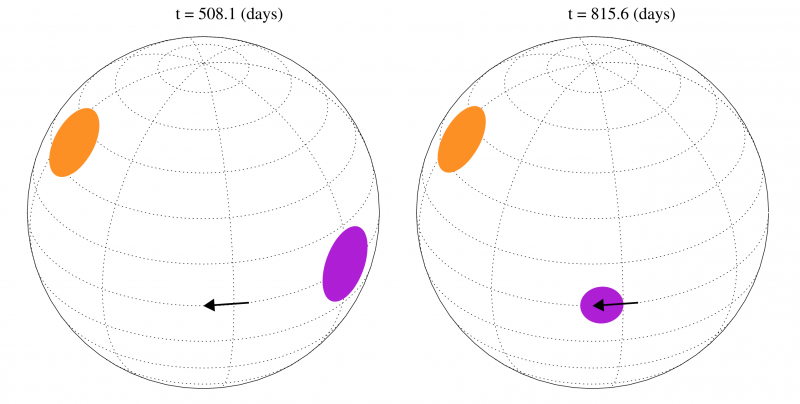 The authors of today’s paper are tracking starspots. 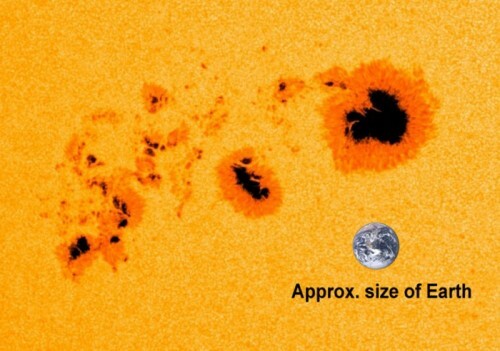 Starspots are the sunspots of other stars, i.e. magnetically active areas on their surface. The magnetic activity of starspots prevents the warm inner regions of a star to rise up to the surface. This makes starspots colder than the surrounding areas, making them appear black (see Figure 1). Therefore, starspots make the brightness of a star fluctuate, as they move across the star. These fluctuations can be detected, and can be used to study starspots. Figure 1: Sunspots, with the approximate size of Earth shown for reference. Image credit NASA/SDO. Unlike the Space Needle and lighthouses, stars are fluid and tend to rotate differentially: the equator rotates faster than the poles, like a smoothie, prepared in a blender—the type with the blades in the middle. Differential rotation causes starspot features to shear and change with time. This shearing and evolution of starspots can be used to measure the rate of stellar differential rotation. We know that differential rotation plays an important role in stellar magnetic dynamos, i.e. in how stars generate magnetic fields. However, the link between differential rotation and the generation of magnetic fields in low-mass fully-convective stars, remains unclear. 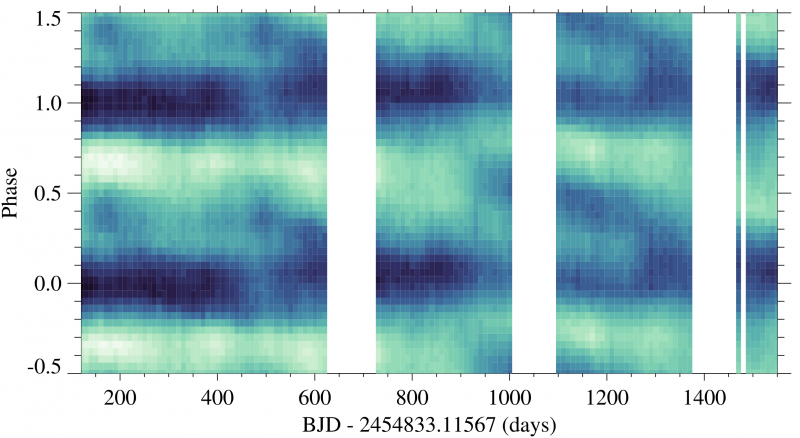 The authors tracked the starspots on the active M dwarf GJ 1243, using photometric data from the Kepler spacecraft. In today’s paper, the authors present the smallest differential rotation rate that has ever been robustly measured for a cool star. Their result provides important constraints for dynamo models of cool low-mass stars. The authors present evidence for starspot features on GJ 1243, illustrated in Figure 2. The primary feature (orange area) is a very long-lived starspot that is constant in phase. The secondary feature (purple spot) evolves on timescales of hundreds of days, both in phase (moves in longitude) and in amplitude. The authors can not determine the exact geometries of these features, which could in fact be two large spot groups (e.g. see Figure 1), but for simplicity they are denoted as single large spots in Figure 2. Figure 2: A schematic illustration of the the primary (orange), and secondary (purple) star spot features at two points in time. The primary feature is long-lived and evolves slowly, while the secondary feature evolves in both phase (moves in longitude), and size. Each feature could be a single large spot, or a large group of smaller spots. Upper part of Figure 4 from the paper. Figure 3 shows the main diagram the authors use to find starspot features using the Kepler data. The figure shows a grid of phase as a function of time for the 4 year data of flux from GJ 1243. A change in phase is here equivalent to a change in latitude of a starspot feature, in the direction of the star’s rotation. Each pixel in the grid spans 0.04 in phase (or 14.4 deg in longitude), and 10 days in time. The shading denotes the flux: the darkest regions correspond to a flux 1.5% below the median value, while the lightest pixels 1.5% above the median value. The phase information is repeated twice (showing phase from -0.5 to 1.5) for visual clarity—for example, the dark band at phase 0 is the same as the dark band at phase 1. Figure 3: The diagram to find starspots: a continuous phase map of the 4 year Kepler dataset for GJ 1243. Pixel shade, from dark to light, indicates the median flux in each (time, phase) bin. White gaps show times with no data. The data is folded twice in phase for visual clarity. Figure 3 from the paper. Using this diagram the authors find two starspot features. Figure 4 shows the same diagram as above, with their best-fit starspot model—assuming two starspot features—overlaid. The dark band centered at phase 0 (overlaid with orange points) is due to the primary spot. This feature does not significantly change in phase and flux. Conversely, the secondary feature (overlaid with purple points), continuously changes in both phase and flux amplitude. Moreover, this feature appears at least three times in the dataset on the opposite hemisphere (phase 0.5) of the primary feature, and then moves in longitude towards the primary. Interestingly, these starspot features are very large compared to typical starspots on the Sun (<1° to about 20°), appearing to span about 50° to 90° in longitude. 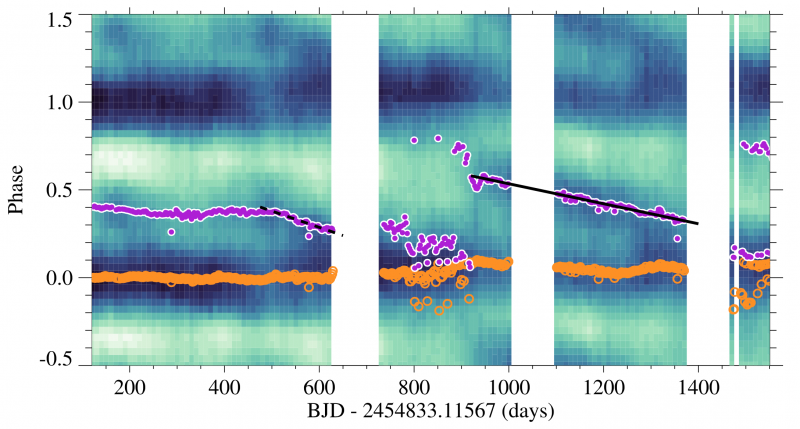 The authors interpret the slow, linear phase evolution of the secondary starspot to be the signature of differential evolution. Using the best fitted lines shown in Figure 4 below, the authors determine a differential rotation rate of 0.012 radians/day for GJ 1243. This is small compared to Sun’s differential rotation of 0.055 radians/day, making GJ 1243 rotate largely as a solid body. 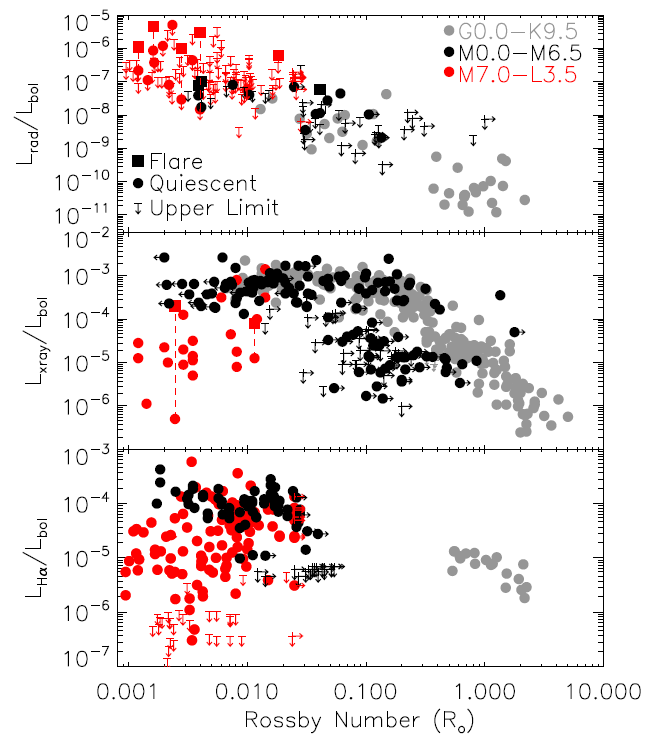 The authors note that this result is in agreement with previous theoretical work in the area, which predicts that differential rotation decreases with increasing stellar rotation rates and decreasing effective stellar temperatures. Figure 4: The same diagram as in Figure 3, with overlaid starspot models. The primary feature (overlaid with open orange points) is nearly constant in phase. The secondary feature (overlaid with purple points) evolves significantly. The linear trend of the secondary feature, fit with black lines, indicates differential rotation. Figure 5 from the paper. Modeling starspots on other stars is challenging. The technique described in this paper is best suited for studying long-lived spots on rapidly rotating stars. 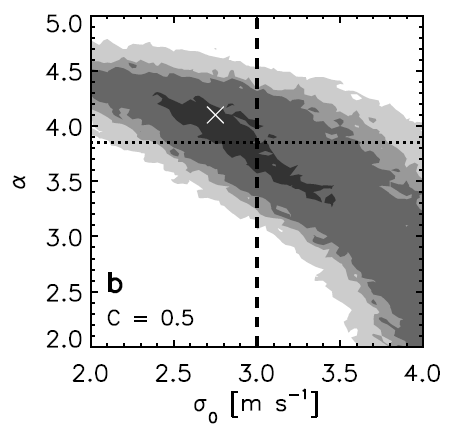 The results presented in this paper have placed important constraints on the magnetic dynamos of cool low-mass stars. With further study, and extending this technique to study hundreds of other rapidly rotating active stars, we can start to gather a better observational understanding of surface differential rotation across the main sequence.